Shaquille O’Neal filed for divorce from his wife Shaunie on Tuesday, citing the marriage as “irretrievably broken” in court papers. 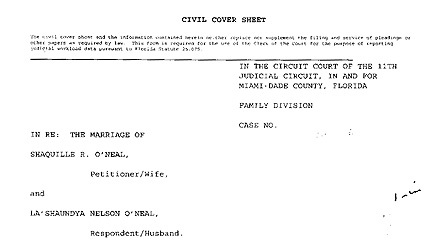 Papers were filed in Miami yesterday, where the couple lives. Their $32 million home is now reportedly up for sale. Shaquille, 35, and Shaunie, 32, have been married for nearly five years and they have four children together. They each have a child from previous relationships and had been together for several years before tying the knot in a lavish ceremony in Beverly Hills in 2002. His petition asks the court to require Shaunie to give “a correct accounting of all money, funds, stocks, bonds and other securities” acquired during their marriage. Shaq has a contract with the Miami Heat reportedly worth $100 million. The couple reportedly has a prenuptial agreement, which he has asked the court to keep private.